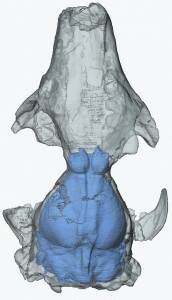 Cranium with virtual endocast of a stem primate. Our goal is to understand all aspects of the early evolution of the Order Primates. Research in the Silcox lab focusses on several aspects of this process. A particular area of emphasis is the group of extinct fossil mammals sometimes referred to as plesiadapiforms, which we think represents the first adaptive radiation of primates. Plesiadapiforms are known from North America, Europe and Asia — their temporal distribution stretches from approximately 65 to 40 million years ago. The group comprises an impressive diversity: over 140 species, grouped into 11 distinct families. We study these species from multiple perspectives, including their anatomy, evolutionary relationships, and reconstructed behaviour. A key element of this work is fieldwork to undercover new specimens of plesiadapiforms, and to help to understand the ecological context in which they lived. We are also very interested in fossil and living groups that are closely related to primates, which help us to characterize what is primitive for the Order at a deeper level. One area in which this is particularly relevant is in the evolution of the brain. We are interested in determining what primitive primate brains looked like, and understanding how they differed from those of their nearest relatives. To help us fulfill this goal, we use high resolution X-ray computed tomography scans to reconstruct the external form of the brain in fossil primates, and living and fossil members of closely related groups such as rodents and treeshrews.